One of the most powerful business tools you're totally ignoring. This guide will cover how to effectively email during those first emails between you and potential clients so you can increase your booking rates, how to prevent yourself from getting ghosted, how to identify whether or not the inquiry is an ideal client or not right off the bat, and how to open up a dialogue between you and your clients to create more meaningful relationships before you ever even meet. I created this guide to help you understand how defining your responses to those initial emails are between you and your potential clients are. 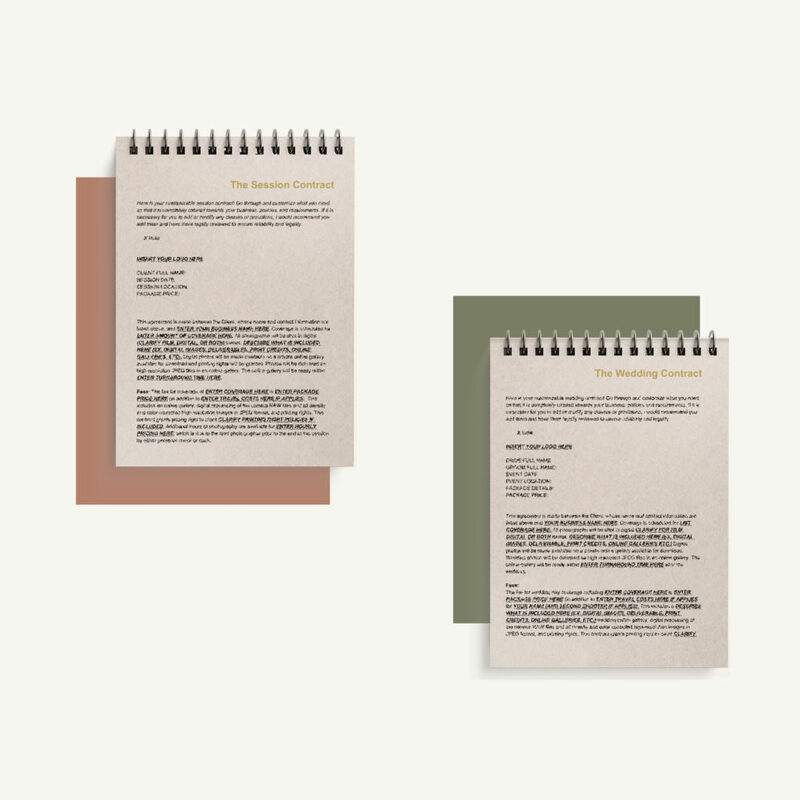 A completely customizable contract template set. Includes a Wedding Contract Template as well as a Session Contract Template that can apply to couples, families, newborns, portraits, children, etc. The contracts are provided in both a Microsoft Word document as well as a Pages document. This contract has been written by a lawyer, so you don’t have to question the reliability of the contract or your protection. Lawyers typically range between $250-$1000 per hour to write contracts, meaning this will save you hundreds to thousands of dollars! You need to make sure you’re always protected in advance before you regret it. Want free education and secret discounts on my guides? Tips and tricks, mini courses, and workshops!